She never ceases to amaze me. 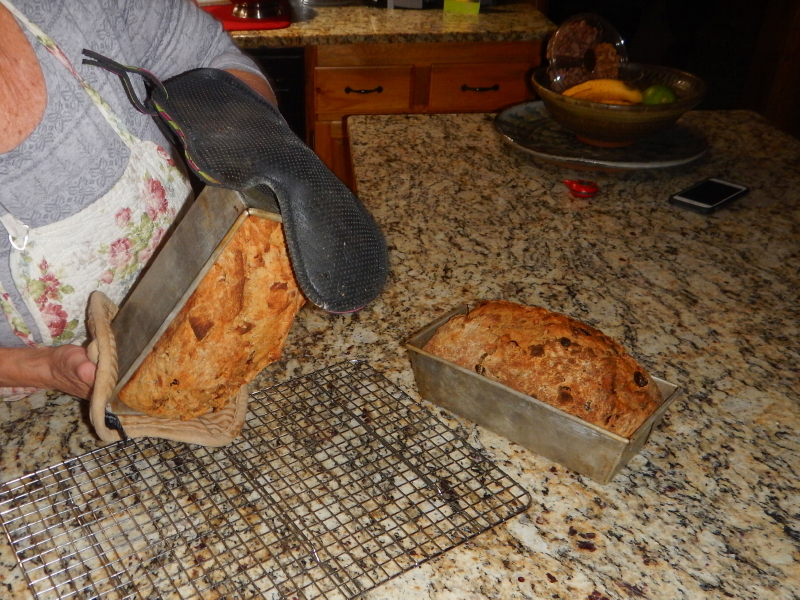 Cyndie has outdone herself with a very impressive first-try baking success yesterday. Too bad you can’t smell the aroma of this image. 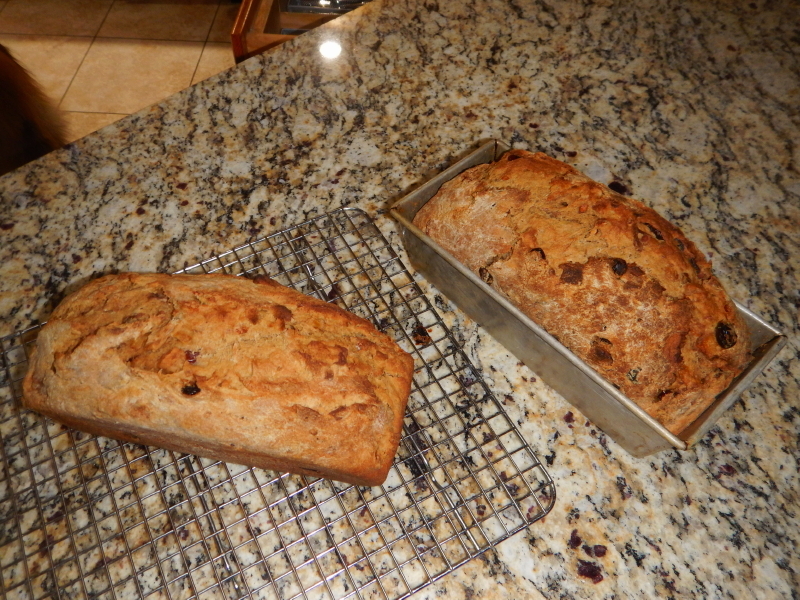 One of the unique treats we enjoy when visiting Cyndie’s parents in Florida is “Breakfast Bread.” Chock full of a cinnamon flavor, just the right amount of cherries, raisins, apricots, cranberries, dried apples, and chopped walnuts, with a texture that works perfectly well for toasting. We loved the treat so much that we wanted to buy some for ourselves when we got home. The problem with that plan was that the only place we were able to find it was at Publix grocery stores in Florida. She had been cunning enough to take a picture of the ingredients on the label of one of the two Publix loaves we hauled home last week in our carry on luggage, which, for the record, earned my bag extra scrutiny going through security at the Fort Myers airport. 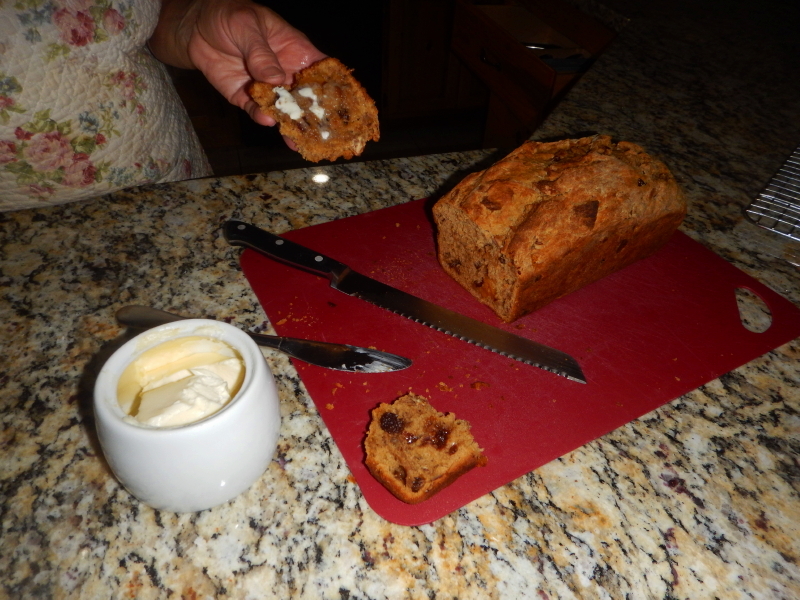 Armed with one of the many breakfast bread recipe ideas from the internet, and her list of actual ingredients from the loaves we know and love, Cyndie set out to bake a couple at home. I asked her how much a loaf costs at Publix and started doing the math. We could sell these, they are so good! It may be time to revisit the latest version of the cottage food laws of Wisconsin. When we moved here, Cyndie researched and discovered Wisconsin had strict restrictions requiring commercial kitchens in order to sell home-baked goods to the public. Since that time, there appears to have been some relaxing of the laws, so maybe it is time we explore new ways to take advantage of her baking skills for generating business income.